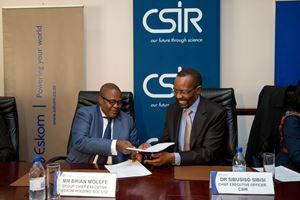 Eskom and the CSIR have signed an agreement to synergise the research capabilities of the two state-owned organisations in support of Eskom’s strategic and operational needs. The agreement covers the next five years and is aimed at aligning and enhancing interaction between the organisations in support of national goals. “We look forward to collaboration with the CSIR as we forge ahead with delivery on our mandate of ensuring reliable power to stimulate economic growth for our country and address socio-economic challenges faced by our people. We will prioritise projects that will ensure our operational and financial sustainability as we refurbish our current plant and deliver on new infrastructural projects to provide much-needed electricity,” adds Molefe. Dr Sibusiso Sibisi, CSIR Chief Executive Officer, says energy is one of the CSIR’s areas of focus. The CSIR’s vision in this area is to help the country achieve an energy-secure and low-carbon national economy. “Together, Eskom and the CSIR can come up with innovative solutions for current and future energy issues, determine what the new electricity system will look like and what the plans and responses should be that need to be put in place to build the future South African energy system,” says Sibisi. To address its short-term requirements, Eskom has identified three imperatives that have been expanded to identify new and existing technologies and capabilities that can address specific challenges. The first imperative relates to the availability and reliability of the existing asset base. The organisations will work together on extending the transmission component’s lifespan through predictive maintenance; real-time grid monitoring using the Advanced Fire Information System; laser-based refurbishment of high-value components; development of a joining technology and non-destructive testing centre to improve build and maintenance quality; analytical testing to ensure environmental compliance; and robotics and unmanned air vehicles for maintenance. The second imperative is aimed at safely delivering on the new build programme and capacity management. Research and development will focus on the reduction of water consumption; development of advanced emission control technologies; development of components for use in advanced high-temperature gas reactors and modelling of associated technologies; load forecasting; and smart energy management systems. The third imperative focuses on financial sustainability. Aspects to be jointly investigated include security risk management solutions to prevent theft and safeguard high-value assets; cable and infrastructure theft detection and prevention; smart meter protection; and detection and prevention of illegal connections and revenue theft. In the long term Eskom is also facing significant challenges from fundamental shifts in the electricity and energy system that is becoming more distributed and flexible due to the increasing contribution of renewable technologies as well as the future focus on new build. Thus the agreement includes the intention to collaborate strategically on flexibility requirements in the future power system; implications of higher penetration of (fluctuating) renewables; establishing new build capabilities and capacity; integrated foresight studies and energy scenario planning; establishment of a joint centre of advanced manufacturing and repair technologies; a national centre of expertise for non-destructive testing and evaluation; skills development and job creation. The partnership will enable the CSIR and Eskom to garner more value from the relationship that is also increasingly being promoted by the principal stakeholders of the two organisations, the Department of Science and Technology and the Department of Public Enterprises.